I was looking at this painting, Rest Stop, here in the studio this morning just before I came across the quote above from the French writer and founder of Surrealism Andre Breton. The two things, the image and his words, merged for a moment in my mind. I saw the Red Chair, as I often do, as a form of memory, a place to stop in order look back in time and retrace my steps just as Breton wrote. The idea that I might be searching for lessons and meaning from the past that somehow escaped my recognition in those past moments sounds right as well. Maybe more than the future or the present, the past and our perceptions of it are great fodder for an artist who is searching for meaning in this life and in their work. They see the present and the future as ultimately products of the past. Some lessons have been learned and some mistakes repeated, but the past seems to always echo forward in time for that artist. And that’s what I see in this painting. 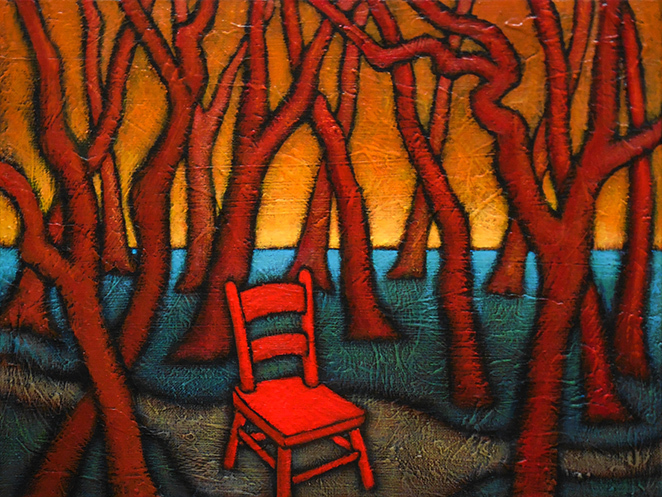 The Red Chair is at a small clearing where it can stop to consider the path it has already traveled as well as the path that is ahead. The trunks of the trees surrounding it obstruct its view so that it has no idea of where it may be headed. The Red Chair uses the present as a rest stop to try to envision a future scouring its memory of the past for clues that might help it imagine and structure that future. This painting, for me, is very much about that part of the artistic process which means, at its core, it is part of the human process. We all formulate our futures with our memories of the past. Most of us do it without much conscious thought, assuming that the lessons of the past have already been incorporated into our present. Hopefully, some of us will take the approach of the Red Chair and sit for a short rest in the present to consider the past and the future as one. Perhaps there are lessons still to be learned and messages still unrecognized. That is certainly what I am seeking as an artist.